The purpose of this study was to analyze the best shot put performances in the Athens 2004 Olympic Games. Multiple high speed digital video cameras were placed in specific locations on the field at proper angles in order to capture the performance of the athletes in the preliminaries and finals. Two stationary cameras were placed at 45 degrees to each other. In addition 3 more cameras used by the NBC broadcasting were used to assist the other 2 cameras. Temporal and kinematics variables were calculated from the videos records and were analyzed yielding three-dimensional biomechanical results. Patterns of the segmental movements were used rather then absolute values, to assist the athletes and the coaches in the analysis of the performances. Kinematics parameters for the best 3 final performers were presented in this study. 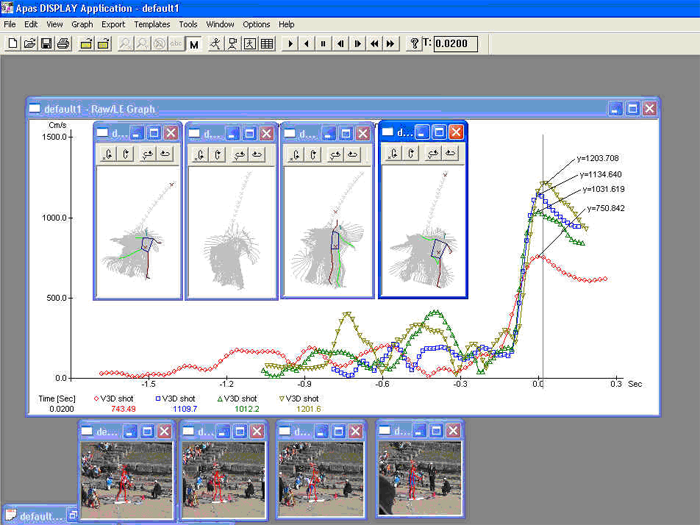 Keywords: shot-put analysis, kinematic analysis; angular velocities; linear velocities; angle of release; 2004 Olympic Games. The shot put competition at the 2004 Athens Olympiad was held in the Ancient Olympia stadium. This was the site of the ancient Games of the Olympiad, 2,800 years ago. Despite skepticism from the rest of the world, the organizers of the Athens games did so many things right and nothing exemplified this more than holding the shot put competition at Olympia. In a games already steeped in history, the organizers thoughtfully connected the ancient and modern Olympics in a serene setting that was so unusual that it will probably be remembered as one of the highlights of these games whenever they are recalled. 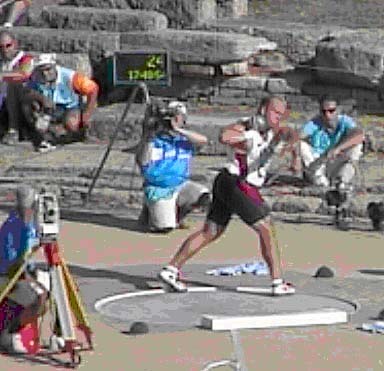 The biomechanical analysis of the Shot Put event was sponsored by the International Track and Field Coaches Association. This was the only biomechanical analysis performed at the Athens Olympic Games where cameras were placed on the performance field. The competition was exciting and the setting was as intimate as it was historical. The shot put normally takes place in the middle of the field with the track separating the crowd from the event that seems so distant as if it's happening in another place. In Olympia, the shot put took center stage as the only event being competed with 15,000+ fans watching right on top of it from the grassy knoll right next to the pit. It was great to be a part of it. The crowd was treated to a fascinating men's event, which ended in controversy when the Ukraine's Yuriy Bilonog tied the United States' Adam Nelson, which meant Bilonog would really beat Nelson, unless Nelson could come back with one last amazing throw, which he did, except he fouled, although he stated he did not foul, but video images really showed that a foul ocurred during the crucial final attempt. So Nelson had to settle for the silver, while two other Americans, John Godina and Reese Hoffa, finished out of contention, far short of his prediction that Americans would sweep the event. The purpose of this project was to collect video records of competitors at the 2004 Olympic Games at Olympia, Greece where the shot put event was conducted. Multiple cameras were placed in key angular locations to capture the activities during the Olympic Games. The cameras were place on the field at specific distance and angle relative to the shot put circle. In addition to the stationary cameras on the field, cameras outputs from the television broadcasting companies were used in assisting the stationary cameras. All throws were recorded at 60 frames per second and performances were analyzed for the present study. All the men and women throws at the preliminary and finals were collected and analyzed. Due to publishing restrictions, only the best 3 performers were analyzed for the present paper. The parameters measured were the bodyï¿½s segmental velocities, center of mass pathway, and release velocity. The kinematic patterns of the various athletesï¿½ segmental positioning were presented for visual interpretation. Multiple high speed digital cameras (60 fps) were used to collect videos of the shot put performers in the 2004 Olympic Games. All throws at the preliminaries and final performances were recorded. Videos collected were transferred automatically to two notebook computers via IEEE1394 interface PCMCIA cards, and synchronized to produce trimmed files representing the complete throws. The trimmed videos from each performer were transmitted through the Internet to a server in order to distribute the data to multiple locations for analysis. All the video digital cameras recorded at 60 fields per second. Shown in Figure 1 are 2 of the 5 cameras views utilized in digitizing the data. Dimensions of known factors and various other measured objects in the field of view were used for the calibration points. Since it was impossible to place a pre-measured calibration frame in the field for security reasons, known measurements on the field as well as utilizing the athletesï¿½ body dimensions were used. More measurements were made on the field the next day. The results were verified against known official measurements of the shot put circle area. The Ariel Performance Analysis System (APAS) was used to conduct the biomechanical processes. Synchronized data sequences from each of the cameras views were utilized. For each camera view, 19 points were digitized. The body parts included the foot, ankle, knee, hip, wrist, elbow and shoulder for the left and right sides of the body as well as the right hand, shot put, and base of the neck, mastoid process the top of the head. Data points were digitized and entered into the three dimensional linear transformation (DLT) module and converted to real displacements. The real coordinate endpoints were smoothed using cubic spline filter. The present kinematics analyses yielded an enormous volume of results. However, because of the time and space considerations, the most significant parameters for the shot put technique were selected for analysis and discussion. The results of the top 3 top athletes were selected for this study. The remaining data is published on a Website and will be presented in the oral presentation at the conference. The resultant velocities curves calculated for the best throws are presented in Figure 3 and the release heights for the athletes are shown in Figure 4. Figure 4 - Vertical heights curves of the hand representing the release heights. 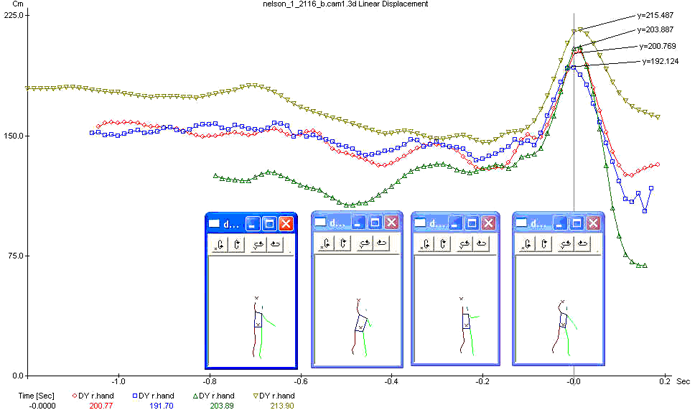 Shown in Figure 5 are the three dimensional resultant velocities for the feet, knees, hips, shoulders, elbows, hands, and the shot put during the finals competition by Belonog, Nelson, and Olsen. The shot put distance depends on a variety of factors. The angle in which the athlete can achieve the optima acceleration of his/her arm segments would represent an optimized performance. Factors that influence optimal performance would be the release height, release velocity, and release angle. Segmental acceleration depends on the technique that allow optimal combinations of the above parameters. Nelson and Yuriy both obtained the same throwing displacement, but Nelson was able to generate 7.2% faster shot projection velocity with 9.4% lower release height, and both competitors putted at the same projection angle. From the present analysis it was determined that Adam Nelson was closest to achieving optimal performance for his movement parameters. McCoy, R. et al. (1984). Kinematic analysis of elite shot-putters. Track Technique, 90:2868-2871. Bashian A., Gavoor, N., and Clark, B. (1982). Some observations on the release in the shotput. Track and Field Quarterly Review 82(1), 12. Ariel, G.B., (1980). Biomechanical analysis of shot putting. Track and Field Quarterly Review, 79, 27-37. Ariel, G.B. (1973). Biomechanical analysis of the shot-put utilizing the center of gravity displacement. Track and Field Quarterly Review, 73, 207-210. Ariel, G.B. (1973). Computerized biomechanical analysis of the world's best shot-putters. Track and Field Quarterly Review, 73, 199-206. Generated on 4/22/2019 10:58:30 AM (PST) ADI/HQ/GBA/2019/ARIELCLOUD/v3.0.2018.0126.